One of the most effective strategies stampers can adopt to improve pressroom safety is to emphasize safety habits to operators. Typically, stampers pay more attention to meeting Occupational Safety and Health Administration (OSHA) standards by implementing equipment changes and upgrades. These hardware improvements can include installation of control-reliable press controls, properly installed presence-sensing devices and auxiliary barriers. While important, these are only the first steps in establishing a comprehensive pressroom safety strategy. OSHA accident reports have long revealed that most mishaps involve some human element. Sometimes the guards are insufficiently designed or improperly installed. Often accidents involve the action or inaction of one or more individuals. This supports the idea that safety programs focusing primarily on hardware issues are inherently weak. Stampers can achieve and maintain low accident records by emphasizing, through training, the importance of personnel consistently executing their daily duties in strict accordance with safe practices. The goal of the hardware aspect of a safety program is to design and install, where feasible, safety equipment that works with no active involvement from the operator. For example, an interlocked barrier device prevents the press from stroking if open. The operator has no control over this function. The training aspect of the program must focus on actions and decisions still within the operator’s control. Like a seatbelt in a car, which is only effective if the driver consistently chooses to use it, good safety habits work effectively only if the operator uses them. Safe pressroom habits must be so ingrained that the operator performs them without having to consciously remember them. The goal of the training program must be to teach people to use safe practices all of the time, out of habit. Employees already have many built-in safety habits before they ever enter a stamping plant. For example, individuals have been taught to watch out for traffic when they cross a street. This behavior, taught from childhood, is performed routinely without conscious thought. Few individuals, however, have been trained to watch for traffic inside a building. Stampers recalling their own first weeks in a plant, or those of a new hire, can attest to the near misses and occasional collisions that occur between new employees and the many fork trucks that roam factory aisles. And the factory is filled with other hazards much less obvious to a new employee than fork trucks. Thus, new employees will have to learn new habits to protect themselves from hazards. • Be wary of fork-truck traffic. • Consistently wear protective equipment such as safety glasses, boots, arm guards, ear plugs, etc. • Use the lockout/tagout procedures provided. • Stand clear of potential hazards presented by the stored energy in a coil of steel during unbanding. • Never set items on the press bolster or slide, or the feed equipment. • Check guarding equipment to ensure proper adjustment and operation. • Stand clear of the slack loop of material on the feed section of a line. • Don’t stand behind the reel where the tail of a coil can sometimes lash out. • Use tonnage monitors to ensure that tooling is within the press’ capacity to run it. • Keep the area around the press free of clutter, oil and other trip hazards. Some stamping-plant hazards are not obvious to the new employee, so the nature of the hazard and the reason for each safety rule should be explained and reinforced. One example: setting of objects or tools on the bolster of the press. Most new hires may consider this just a housekeeping issue. But even a small press closing on an object can shoot the object like a missile or send metal shards out like shrapnel. An experienced operator relating specific accidents or near misses caused by this phenomenon drives the message home. 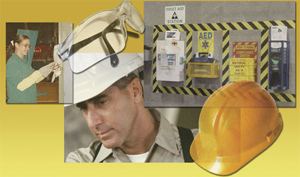 Once the list of good safety habits has been developed, personnel training can begin. As previously mentioned, since the equipment and environment of the plant is new, some hazards are not obvious to the first-time observer, and the rules may seem arbitrary to trainees. The most effective method for overcoming this obstacle: Explain the nature of the hazard and the reason for each rule as it is presented. Include experienced personnel in the training—their real-world experience will reinforce the safety habits being taught. One example of this can be found in the rule regarding the setting of objects or tools on the press bolster. Without an explanation, most new hires would consider this nothing more than a housekeeping issue. 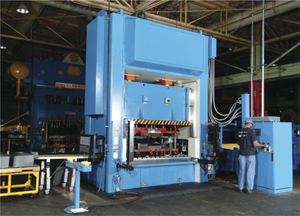 However, most people unfamiliar with, or new to, stamping operations, are unaware of the power of even a small mechanical press. If a press closes on a Thermos bottle or other object, that object can be ejected out of the die area like a missile. In the case of a solid object such as a tool, a grenade-like explosion can occur, sending metal shards in all directions. An experienced operator relating specific accidents or near misses caused by this phenomenon drives the message home.